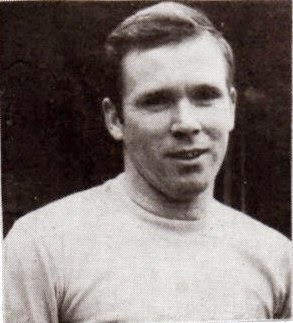 A name synonymous with Barnet Football Club and the 1960’s is Roger Figg. The reasons? Well, over 250 goals in eight seasons is one for a start. Couple that with nine goals in nine England Amateur Internationals and then add that he formed lethal strike partnerships with both Tony Harding and Les Eason in Barnet teams that won 3 championships in a row between 1963 and 1966 and we might begin to understand. Born in Park Street St Albans – he still lives in his childhood house - in 1939, he became an apprentice gas fitter at 14, an occupation that has supported him throughout his working life, and signed for Hitchin Colts. By 17 he was in the first team as a right winger. “It wasn’t until I signed for Barnet that Dexter Adams really saw my potential as an inside forward. The team were obviously lacking something at the time and Dexter said ‘do you fancy a go?’ I told him I would give it a try and loved it. It suited me because you are always in the game and I loved being involved”. The fact remains that even as a winger Roger scored goals galore at Hitchin and indeed at St Albans where he had a short spell in the late 1950’s. Barnet manager Wally Lines originally approached Figgy in Autumn 1961, “I also met up with Alf D’arcy who was the Captain, my brother Brian was at Underhill too. It was a much bigger club and they offered me few more bob!” he laughed. Brian Goymer, Jeff Voyce, Micky Cooper, Les Picking, Alf D'arcy, Bill Belger, Roger Figg, Dennis D'arcy, Tommy Edwards, Brian Figg, Reg Finch. The following Saturday he opened his goal account with a hatrick in a 5-2 win at home to Redhill. During Roger’s stay at Barnet the team never finished lower than 5th in the table. “Yeah we some great teams and it was a great time to be playing football. It got even more exciting when Dexter Adams came in and he signed some fantastic players. Later on came Colin Powell and Gerry Ward, who was pure class and a real gentleman but my favourite period was those early years when we strolled the Athenian League. 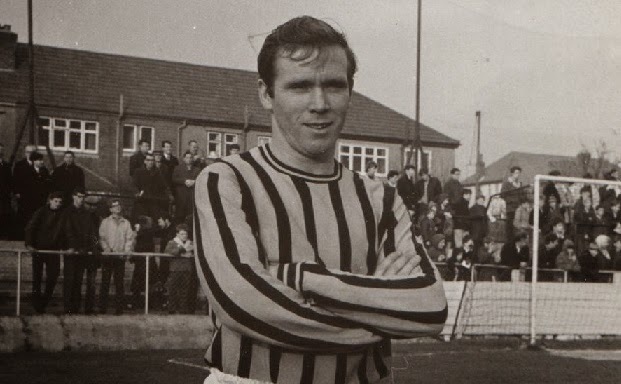 In 1963-64 Roger played in 79 games, including the Eastern Floodlight League, and scored 49 goals including five at Spennymoor in the FA Cup. I asked him how he managed to get time off work to play? He gave out a belly laugh “Don’t ask, don’t ask. We trained on a Thursday night at the ground and in the gym at Ravenscroft school. I loved training but really we used to spoil it and go and have a few pints afterwards!” he admitted with a huge grin. Ultimately Roger received offers from the Football League “Peterborough, Reading and Cambridge Utd approached me but I wasn’t a risk taker and I was settled. Maybe I should have moved on but I remember it didn’t feel right at the time somehow”. He picked out the games against Preston North End in the FA Cup (a 3-2 defeat in front of nearly 11,00 at Underhill), the FA Amateur Cup semi final against Crook Town (in front of nearly 20,00 at St James' Park Newcastle) and the FA Cup tie against Enfield in 1964 (a 4-4 draw followed by a 3-0 win at Underhill in the replay). “The old ground was packed to the rafters that night and we played some wonderful football probably the best I ever experienced at Barnet. I scored and Reg Finch grabbed two”. He reminisced some more, chuckling all the time “My friends were Dennis Roach and Barrie King who I used to travel to games with, they are lovely lads and I still keep in contact with them. We seemed to have a party at someone’s house every Saturday night then, it was great. I came across my old friend Alf D’arcy once when he was playing for Enfield and he literally gave me a punch when we first challenged for the ball. He was just trying to wind me up and I gave him one back!”. Roger continued to score goals even with competition from the likes of Tony Harding, Les Eason, Tony Turley and Billy Meadows. “We would play with five forwards – Paddy, Les, Billy, myself and Ricky George. The circumstances behind Roger leaving Underhill in 1969 have always been a little bit baffling to us supporters and the incident did leave a sour taste in his mouth although he did say that it is in the past now and he has no axe to grind. He was very magnanimous and honest by saying, “I was accused of not trying in game. I took the allegation to the FA and was eventually cleared but maybe I should have just swallowed it. I fell out with the Manager and the Board over it at the time but Dexter and I became friends again soon after but the incident also coincided with me due my benefit match bonus that I didn’t receive. I sent a letter to the Chairman but that disappeared. It wasn’t a fortune but nevertheless it was due. I also cracked my Tibia bone in a game against Dover and by then the whole series of events made my mind up to move on, sad really. My old pal Dennis Roache was at Bedford Town so I went there. Frankly it wasn’t a successful move and I started to fall out of love with game”. His secret for goalscoring? “As an inside forward my theory was to work hard and make runs across the pitch all the time. Keep moving remembering defenders couldn’t always go with you, and mostly didn’t want to go with you. Eventually I would end up in space to receive the ball with a chance at goal”. That sounded too easy but obviously it worked perfectly for Figgy. He certainly was revered as a player in the amateur and semi-pro game. Alf D’arcy, one of the greatest English defenders never to become a professional, once told me “Roger was the best forward I came up against, so quick and a good header of a ball for a short man. He could shoot with left and right, and never stopped running”. Roger retired from football aged just 33 and sadly has never pulled his boots on since apart from running the line for his son’s and grandson’s teams. “I am too stubborn that is my problem”. Roger is now fully retired aged 73 and plays golf off a 14 handicap for recreation. The clues were all over his house, with a putting machine and balls on the floor in the sitting room. When I spoke to him he was full of questions about the club and certainly wished us well for the future. Roger Figg was a truly great player, a player who scored lots of goals season after season, equally proficient with both feet and his head, regularly playing two games a week over the best part of a decade, the type of player we are extremely unlikely to witness ever again at our football club. Roger and my old mate Richard Dumayne or "Figgy Bee" - just for you Sunshine! My induction to football at Underhill, and watching Figgy and Les Eason tear teams apart as a 11 year old ,, Great memories and thanks to them ,,, Roachy made a few quid from Agents fees tho !! !